The Barker Dam Nature Trail is an interpretive 1.1 mile loop trail begining in Barker Dam parking area. 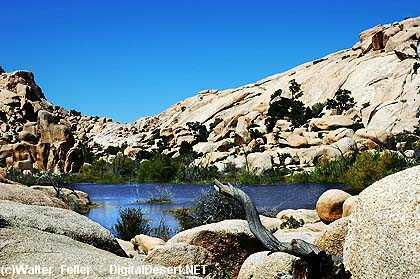 Barker Dam is a water-storage reservoir constructed by ranchers in the early 1900's. It is situated between Queen Valley, and the Wonderland of Rocks, west of the Wall Street Mill. It is a watering place for desert wildlife, including many species of birds, and desert bighorn sheep. ...has adapted to living in the Mojave Desert,.. Originally built about by C. O. Barker, a cattleman, around 1900 to supply water for livestock. Later, about 1949-1950 the dam was raised by Bill Keys. Concrete and stone dam of irregular shape is 150' long, 20 feet high and 14" thick at top. Lower, downstream portion of dam is surfaced with stone. Lowest 9' of dam, the Original Barker Dam, was constructed of concrete surfaced with stone on the downstream side. The height of dam was raised an additional 6' of concrete in 1949-1950. Dam has several indentations. Inscription at top reads: "Big Horn Dam Built by Willis Keys, W.F. Keyes, Phyllis M. Keys, 1949-1950."